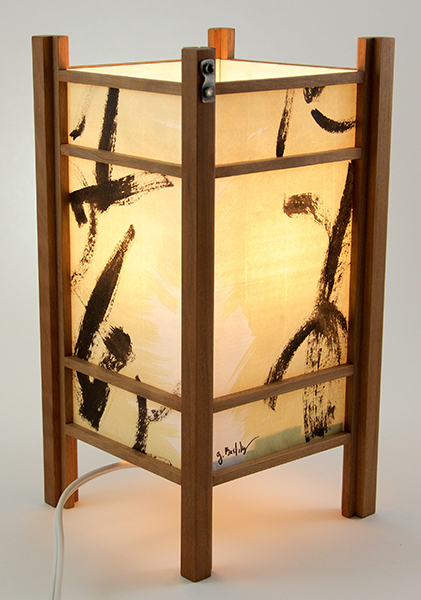 The lamps displayed on the Home page are a synthesis of photography, woodworking, and light. I’ve been working on a photography series since the 1970s which I refer to as the “Entropy Series,” an attempt to capture the beauty in the ordinary. I’ve spent countless hours roaming around old warehouse districts and often run-down commercial neighborhoods in Berkeley, San Francisco, Seattle, Tucson, and many other locations, here in the US and abroad, allowing myself to be drawn into the beauty of Nature reclaiming its materials from these man made structures. The camera allows me to frame, out of context, specific parts of the crumbling structures that present an unexpected beauty among the dirt and decay. Humans create buildings to house themselves and their work, to give shelter, to bring in power to run the heat, the machines used to build more machines, to bring water for sustenance and to take away waste. Over time, as rust builds on rooftops, moss grows on pipes, graffiti covers walls, windows crack, and doors sag, an entirely unplanned architecture is created and that’s what I try to capture. Art is meant to help people to see beyond that which they would normally look at, but not really see. There is beauty everywhere, but we rarely stop to see it. My objective is to show it to you and hope that when you are out in the world, that you will learn to stop and appreciate what is hidden in plain sight. All visual arts are in some way, a manipulation or a rendering of light. A painter tries to capture light as it falls on a scene, and to replicate the colors that are made of light. A photographer is intimately involved with light, as every shot requires one to think in terms of how much light for how long a time can fall on a piece of film or a digital sensor in order to produce an image that is meaningful. Composition is the framing of a scene, while light is what makes it possible for us to even see it in the first place. Having been a painter for many, many years and a stained glass artist, I came to a very early appreciation of the importance of light in the creation of art. Having lived in the San Francisco Bay Area for almost 25 years, and in Seattle for another 20, it became clear to me how different the light is in those two places, and how it affected my work, both positively and negatively. Many famous artist, such as Matisse, loved light and especially Mediterranean light. A few years ago, thinking about light and working on a hand-made book in the Japanese style, I held up a piece of printed Japanese paper that I was planning to use for the cover, and as the sun shone through the window onto the paper, I suddenly saw another depth, a layer of information in the paper that I hadn’t seen before. I made the connection between this and my previous stained glass work and it came to me that what was needed next was a lamp to shine the light onto paper to reveal hidden depths. 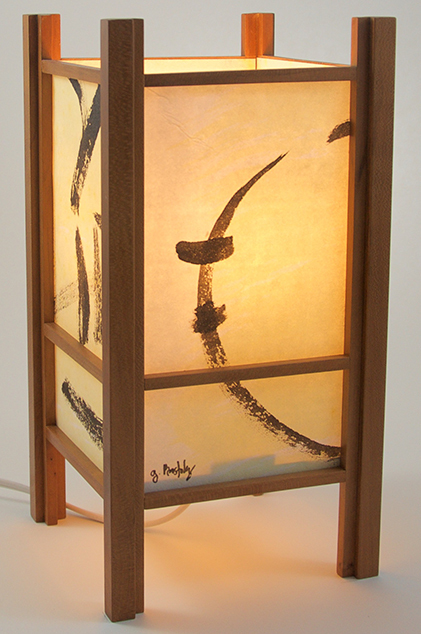 For the past few years I have been perfecting the woodworking and the lamp style, inspired by my love of Japanese art and design, and the “shade” which the light would shine through. 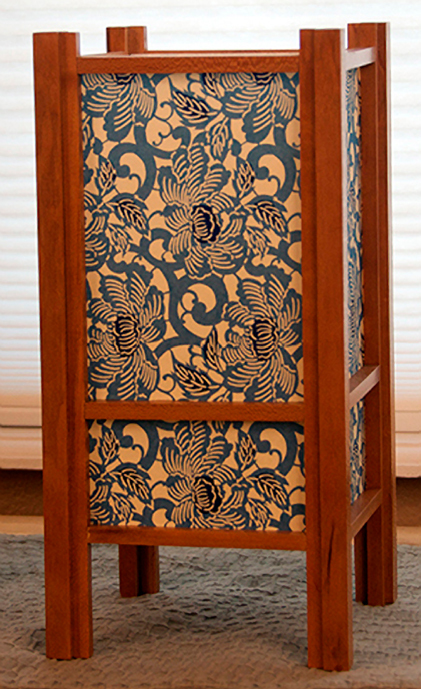 At first I was using a pre-print Japanese paper, much like the one that lead me to this, called Chiyogami paper. 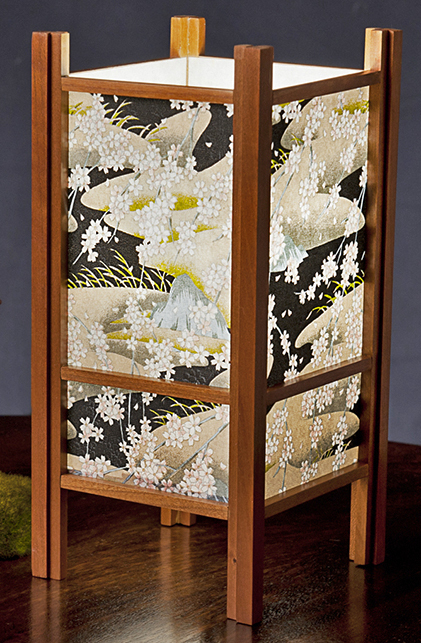 It has been produced in Japan for centuries from multiple plates with many of the designs originating from textile designs. My next step was to use my own sumi and watercolor paintings that I had worked on for a number of years in an Abstract Expressionist style on a special Japanese-made paper. Finally, as I perfected the wooden frames, which are made of locally-sourced cherry or walnut, I came to realize that the best “shade” for these would come from my own photos. These are printed on the same Japanese paper I had used for the hand-painted series, but I am printing them on an inkjet printer using archival inks. As you can see, many of the photos from my travels display doors and windows, and corridors. I can’t help, when I see an interesting door, often within the “entropy” context, to wonder what is going on behind it, how many have walked through it and for what reason? To go out shopping for groceries to cook a meal for guests coming in? Who built the door and what is its meaning, such as the door on the duomo in Florence, Italy? And windows, as people look out and we, below, look in to meet them. How much light do they allow inside and how much do the inhabitants want to keep out? Corridors, roads and walkways lead to discovery, to doors of welcome or doors that remain closed in anger or fear. I love nature and although we build structures to keep nature out, we are still one with the Earth and all its creatures. I’ve planted many gardens and not a few trees over the years, and as most of us do, I look forward to spring, and the arrival of flowers and the insects whose survival depends on them. So, I have incorporated scenes of nature into my lamps alongside the street scenes, entropy, and classic edifices. Let your mind wander as you look at these and imagine what you will. Use your own stories to complete them. They are for you and their stories will change over time as your stories change and grow.